YOKOHAMABASEDNPONEEDSOMEONETHEFIRSTWEEK OF DECEMBER TO HELPWITHTHEIRANNUAL business report, including meeting minutes yearly statements. this requires someone with excellent Japanese and some basic English skills as the org is run by people from various countries. FEW’s Dazzling Bonenkai! 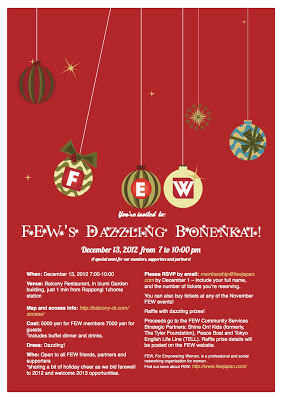 Thursday December 13, 7:00-10:00A special event for our members, supporters and partners. Doors open at 7PM for drinks, food and networking and a special night wrapping up 2012! The FEW Bonenkai is open to friends, partners and supporters. Bring your darling and some friends (men and women) to share in the holiday cheer as we bid farewell to 2012 and welcome the new possibilities 2013 will have to offer. 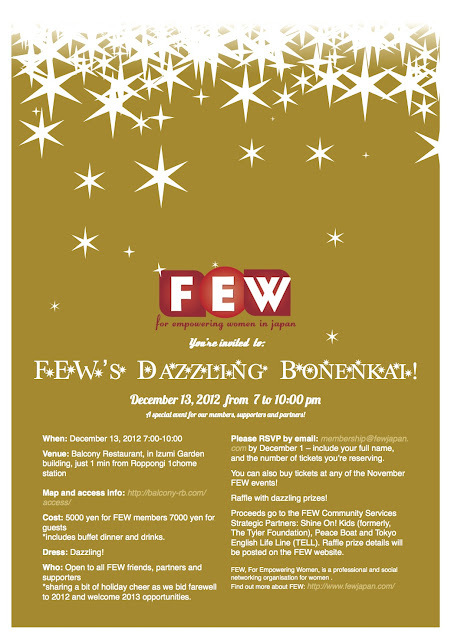 Please RSVP by emailing usmembership@fewjapan.com by December 1 - be sure to include your full name and the number of people you are bringing. "We're all mad here! ": Alice is having a rough time and her family situation is less than perfect. The world outside her front door seems terrifying, but when a white, mochi-making rabbit grabs her hand and leads her down a washlet, she is pulled into a wonderland she didn't see before. A world where sumo wrestlers recite poetry, expat wives keep pigs for babies, and having a cup of tea is like navigating an obstacle course. This interpretation,derived from Lewis Carroll's children's classic Alice in Wonderland, opens at Ebisu Echo Theater and features an extraordinary group of Tokyo talent. Take a trip with Tokyo International Players this winter, and have fun as Alice discovers that home is where the heart is. Tohoku Planning Forum　Workshop with Arup and TPF2 Forum　1 December 2012.
an all day workshop session with Arup where we will be focused on "execution NOW". It will immediately be followed by a TPF2 Forum. It promises to be an exciting day! Please see the information below. The venue will be Shibuya offices of Arup. See www.tpf2.net for all details. The workshop will commence at 1000hrs and finish at 1530hrs. We will have time for a brown bag lunch at about midday. The TPF2 Forum will be held in the same rooms from 1600-1800hrs. As always it will be on ustream too. 1. Identifying Actors: What are the concerned actors and their needs, constraints, and opportunities? 2. Extending Principles: How should Ishinomaki's redevelopment principles be extended to transform the city and region in a truly resilient way - with taking local actors into account? the info below has been taken from various site - your help still needed! Several local agencies will be looking for volunteers to help with the disaster recovery. Duco Delgorge has invited you to the event 'Green Mondays - The Real Cost of Suicide' on Green Mondays! Please join us for the final Green Mondays of 2012, on November 26, 7:00pm at Egg, Shin Marunouchi Building. "The real cost of suicide." A look at how one suicide can affect society in a large way. Chris Earnshaw is a long-term expatriate in Japan. He has been the president of Addison Whitney Japan and the Brand Institute Japan, both pharmaceutical consulting companies. Previous to that he worked in Societe Generale as deputy general manager, and in Merck-Banyu and GSK in management roles. His interests include Aikido and playing the 'cello; he is the author of five books and is now completing his sixth, "Practical Homeopathy." I have put some excerpts below - this info will be added to the Japan volunteer website later today. call 1-800-537-7397 or 609-775-5236 and 908-303-0471.
manual labor - sign up at Interoccupy.net/occupysandynj/. 英語: 流暢日本語: 流暢現在日本在住の方に限ります 説明 We are looking for a results oriented, motivated individual. With excellent people skills, computer skills, and English/Japanese fluency. Background in business or social entrepreneurship a plus. Remuneration, accomodation and other benefits available. Position is Full time, with our NPO that is currently working in Tohoku. NGO jobs and volunteer opps! 3 organizations are looking for full time contract employee 1.Executive Director for the Japan office of an international NGO: at least 10 years professional business experience, will work with corp. leaders, Government officials and NGOs in Japan, and oversee several local NGOs offices overseas. Responsible for daily running and strategic planning for the organization; key representative of the org both domestically and internationally. Responsible for over seeing the financial strategy (fundraising plan). Superior native Japanese communication skills and high-level English skills. Run for the Cure®/ Walk for Life on December 1st!